Sterner Automation has developed a variety of standard and custom assembly products for both the automotive and electronics industry. These offerings encompass a diverse range of technologies and focus on increasing quality through error proofing the assembly process. 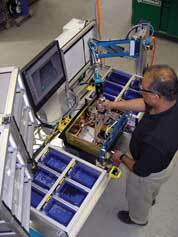 Sterner Automation test products include a broad range of offerings for the electronics and automotive industry. They range from manual testing stations to inline fully automated testing solutions. Our advanced engineering knowledge allows us to work in high technology areas such as RF, in-circuit PCB, functional PCB and LED measurement. 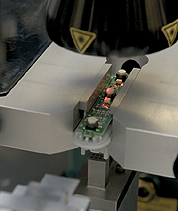 Sterner Automation calibration and communication products allow machine builders to circumvent the most difficult operation for automotive machine builders, communicating to the vehicle ECU. Sterner Automation’s interface equipment provides a standard communication device that can be tested in-house and updated remotely while lowering engineering costs by centralizing the programming task.